Summary: Markus Novak just wants to come home. An investigator for a Florida-based Death Row defense firm, Novak's life derailed when his wife, Lauren, was killed in the midst of a case the two were working together. Two years later, her murderer is still at large, and Novak's attempts to learn the truth about her death through less-than-legal means and jailhouse bargaining have put his job on the line. Now he's been all but banished, sent to Garrison, Indiana to assess a cold case that he's certain his boss has no intention of taking. As Novak knows all too well, some crimes never do get solved. But it's not often that the man who many believe got away with murder is the one calling for the case to be reopened. Ten years ago, a teenaged girl disappeared inside an elaborate cave system beneath rural farmland. Days later, Ridley Barnes emerged carrying Sarah Martin's lifeless body. Barnes has claimed all along that he has no memory of exactly where -- or how -- he found Sarah. His memory of whether she was dead or alive at the time is equally foggy. Tired of living under a cloud of suspicion, he says he wants answers -- even if they mean he'll end up in the electric chair. 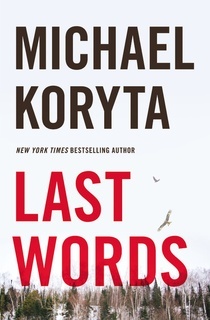 When I picked up the latest from Michael Koryta titled LAST WORDS, I had no idea it was the start of a series... but I'm sure glad it is. This latest suspense story from one of my favorite authors was highly entertaining, and I think the main character Markus Novak is fantastic too. I'm definitely looking forward to more from Mr. Koryta and Markus in the future! LAST WORDS tells the story of Markus Novak, a private investigator for a firm that takes on Death Row inmates' cases when they appear to be innocent. Markus's wife also worked for the firm until her mysterious death almost two years ago -- her murder was never solved. Markus can't rest until he solves the murder, and his obsession has forced him to commit some questionable actions. His employer has basically banished him to a remote part of Indiana to assess a cold case until things blow over. Novak is less than thrilled to be in Indiana examining the death of a girl in a cave that occurred ten years ago, and he intends to go through the motions. It does strike him as strange that Ridley Barnes, the man who is suspected (but never charged) for the girl's murder, is the one requesting that his firm re-examine the case; and it doesn't take long for Novak to discover that this man is extremely strange and even dangerous. As Novak begins to "investigate" the girl's murder, he discovers a few more mysteries -- who is the mysterious woman that he encounters?, is Barnes being totally honest?, and why is everyone in the town refusing to cooperate with him? What started as a way to get Novak to lay low until things blew over ends up turning into a fight for his own life. It probably won't be surprising that I really enjoyed LAST WORDS -- I always seem to like everything Mr. Koryta writes. He is a gifted writer with great story lines, but he also has a special way with words. And in the case of LAST WORDS, his skill with writing harrowing descriptions really shined. I definitely wouldn't say this book was in the horror genre, but it scared the heck out of me. The scenes that take place underground, in the caves, are harrowing to say the least. I always knew I was a little claustrophobic, but LAST WORDS put me over the edge. I don't know that I'd say LAST WORDS was my favorite novel by Mr. Koryta, but it still as an excellent mystery. I loved the twists and turns (and even the creepy cave scenes), and I honestly didn't know how Novak was going to figure out what happened to the girl in the cave. Heck... for awhile, I wasn't even sure Novak was going to be alive to make sense of everything. All in all, the mystery was very well done and quite smart in how it was revealed. I think what brought LAST WORDS to the next level to me was the character of Markus. He was so complicated and just gripped by grief and guilt. I loved how well-developed he was and his flaws really made him interesting... and human. I look forward to being along the ride for Markus's new investigations, and I sure hope to get more information about his wife's murder. I highly recommend LAST WORDS to fans of suspense novels. Mr. Koryta has done it once again in creating an intriguing story with memorable characters. Thanks to the publisher for providing a review e-copy of this novel. I've got a copy of this book and look forward to reading it. Had no idea it was the start of a series, but Koryta has done series books before. And I love his whole way of inserting a bit of 'horror' or 'supernatural' into his books. Thanks for sharing! Wow, this sounds like the start of a great series! I love his writing. I am very claustrophobic so this book would very scary to me! It sounds really good and suspenseful. I haven't read anything by this author before - sounds like I should!